I always notice there are two kinds of people in the world. One type loves people. They care about others. They consider the feelings of the people around them. They would never do anything to knowingly hurt someone. They live their lives trying their best to build up and not destroy. When you find someone like this, it’s like finding a real treasure. My daughter is one of these people. Deb K. and Marg W., this also describes you. The problem with being like this is that there is another type of person in the world who waits in the sewers wanting to take advantage of and use and abuse this first type of person. To the other type of person, they are the only people on earth who matter. If they destroy people’s lives for their own gain, it doesn’t even bother them. They have long since lost what little conscience they ever had. They will lie about you at work to get themselves ahead. They will sleep with your spouse just to give their own ego a boost. They will lie, cheat, commit adultery, whatever they feel like doing- all to their own gain. All that matters is them. They do not notice anyone else. They will cause pain and anguish to their own spouses or their own children, and they don’t care. The only feelings that matter are their feelings. In fact, they consider themselves the poor victims. These are some of the most evil people on earth. The godly people are like the first people. They want to do what God wants them to do. They follow godly ways. They make lives better. A good friend of mine lost her husband yesterday. People don’t want to talk to someone like her. She’s grieving. They don’t know what to say. It’s not a pleasant thing. I phoned her. I’m not shying away from any help I could give her. She could always tell me, “Roxanne, I just can’t talk right now”, and I would have completely understood. But that’s not what happened. She was so grateful I phoned. We prayed together and as I said goodbye, she told me that she felt like warm honey was flowing over her in her grief. She told me it felt wonderful. It was truly an amazing thing to be able to make some little difference in this wonderful woman’s terrible day. That is how I want to live my life- not trying to tear down and destroy but building up and making a godly difference. The interesting thing is that God takes those evil, wicked people and avenges the godly. The godly just sit back and watch it all happen. Avenge means to not only bring a stop to evil, but also to be paid back for everything that was done to you. It’s a pretty scary place for the wicked to be who have come against the godly. God rewards the godly. “The Lord rewards every man for his righteousness and his faithfulness” (I Samuel 26:23). “For He will render to every man according to his works (justly as his deeds deserve)” (Romans 2:6). If you have ruined someone’s family, you are being paid back what your “deeds deserve”. If you have ruined someone’s career, you are being paid back what your “deeds deserve”. There are people who see the deeds of the wicked, but they keep their heads in the sand and say, “It’s none of my business.” Actually, if you do nothing, you are approving of what is done and are as guilty as the wicked. You take part in abortions, you have killed. Your friend is sleeping with someone’s husband, and you keep her as a friend and ignore the evil she has done, you are as evil as she is. You know a company has lied and destroyed someone and you keep quiet to protect yourself, you are as guilty as they are. It’s time we started living our lives with more than just ourselves in mind. It’s time we stood up for righteousness and truth. It’s time we opened our eyes to see where we are headed. People think the evil they do to others in secret is safe, but God brings all evil into the light. Brace yourself. God is tired of evil and is cleaning things up. Evil people are in big trouble. 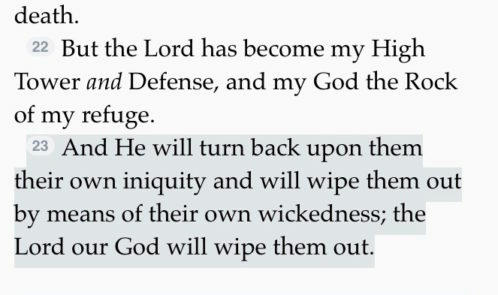 “And He will turn back upon them their own iniquity and will wipe them out by means of their own wickedness; the Lord our God will wipe them out” (Psalms 94:23). So what evil people do to others is going to come back on them. If you are trying to destroy someone’s career, what’s going to happen to your career? If you are trying to destroy someone’s marriage, guess what’s happening to your marriage? If you try to destroy someone’s family, guess what’s coming on your family? Brace yourself. God’s had enough.